The Ultimate VeggieTales Web Site! » Where’s God When I’m S-Scared? Where’s God When I’m S-Scared? Join Junior Asparagus as he brings us a lesson in handling fear. It’s two great stories on one DVD — Tales from the Crisper and Daniel and the Lion’s Den. 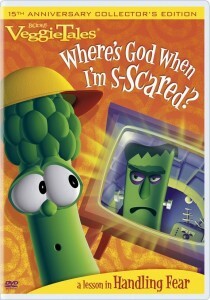 Loaded with fun and several bonus features, enjoy the very first VeggieTales episode with your family! Tales From the Crisper – After watching a scary Frankencelery movie, Junior Asparagus is reminded that there’s no need to be scared of monsters because God is bigger than the boogie man! Daniel and the Lion’s Den – We head to ancient Babylon for a musical adaptation of this classic Bible story. When Daniel finds himself in deep trouble, he learns that he’s still in God’s hands!